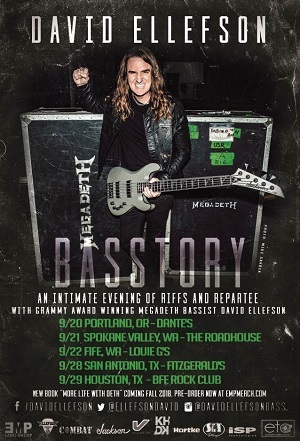 Megadeth bass player David Ellefson has a new memoir on the way, “More Life with Deth,” and now, he also has a tour to go along with the new read. The tour, dubbed the Basstory tour, will offer an “intimate evening of riffs and repartee.” The trek will kick off Sept. 21 in Portland, Oregon, and will run through a Sept. 29 date in Houston, Texas. For information on the tour and to find tickets, head to the tour’s official website at DavidEllefsonBasstory.com. “More Life with Deth” is Ellefson’s follow-up to his 2013 book “My Life with Deth.” The new book kicks off in the mid-2000s and takes readers from the time Ellefson left Megadeth through his reunion with Dave Mustaine and company in 2010. “More Life with Deth” will hit stores in November.